Any vehicle has one of two types of frames which is a body on frame or unibody. Body on frame is mostly for trucks and SUVs while the unibody is used for most automobiles and some smaller crossover SUVs. There are a few cases where there is a combination of the two body styles like in a Jeep Cherokee. The frame of the vehicle acts like a skeleton providing the dimensions of the vehicle, a way to align other parts, and is built to absorb the energy of a collision so the passengers are kept safe. Another vital part of the car is the suspension system because this is what provides that smooth ride down the road as well as holds up the frame or unibody. At Laguna Niguel Collision Center, we understand the critical role that these components play in the everyday lives of commuters and we take great effort to provide the highest quality service and repairs to you. In about half of all collisions, the frame or unibody is damaged to some degree. Despite the popular belief that once the frame or unibody is damaged the car is no longer any good, it can be repaired if properly diagnosed. There are five primary types of frame and unibody damage which are Diamond, Twist, Sag, Sway, and Mash. Diamond damage to the frame is when one side is pushed out of position either forward or backward causing the frame to be a diamond shape if you’re looking from the top. The next type is a twist damage which is when the frame is not level. One or more of the corners on the frame or unibody has been pushed up or down causing it to twist along the center and making the car unstable especially when turning. The another type is sag damage which can sometimes be confused with the twist and vice versa. In sag damage a portion of the car just sags causing the gaps between panels to have a taper to them. Another type is the sway damage which is usually found at the front or back of the vehicle when the frame tilts to one side. If there is a serious collision where the car was hit in the center, the force of the impact could cause a double sway. The final type of frame and unibody damage is called mash. Mash damage is when any part of the unibody is shorter then manufacturers specifications and usually indicated by wrinkles or distortion of the fenders, hood, or frame horns or rails. Mash damage usually occurs when there is a direct front or rear collision. 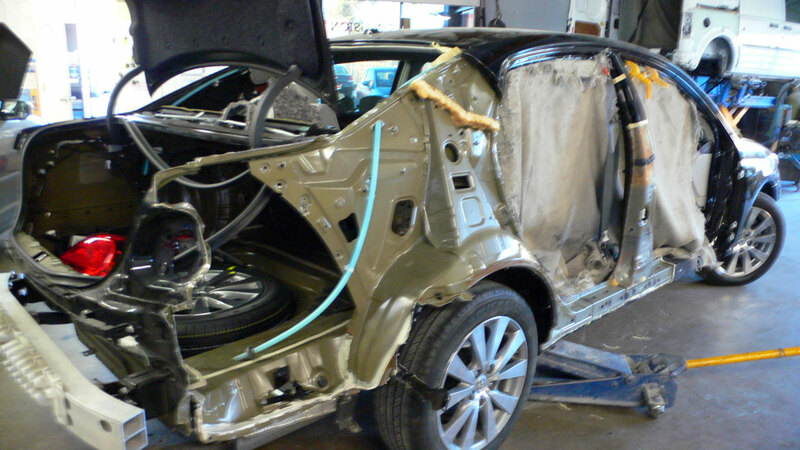 All of these frame or unibody damages can have a serious wear and tear on the rest of the car if left unrepaired. It also puts the driver and passengers in real danger but all of these things can be repaired by our expert technicians and quality instruments so that your car is in to notch working condition. The car's suspension system is a network of cooperating components that provide that smooth stable ride and usually the component that takes most of the physical abuse from the road. It's no wonder that this is usually one of the first components to wear down or even completely break. Look for signs that the suspension has a lot of wear and tear like feeling the car is starting to pull to one side while driving or the wheels start to drift or wiggle. Some other common signs are: bouncing, dipping, diving after going over bumps, the steering wheel is hard to turn especially at slow speed, excessive or uneven tire wear, and steering wheel vibrates at high speeds. Whether your vehicle has a conventional suspension system with shock absorbers or a strut-based system, the technicians at our collision shop have the expertise to diagnose and repair any problem. We also have the right equipment necessary to correct any issues we might find so that you can get back on the road safely. 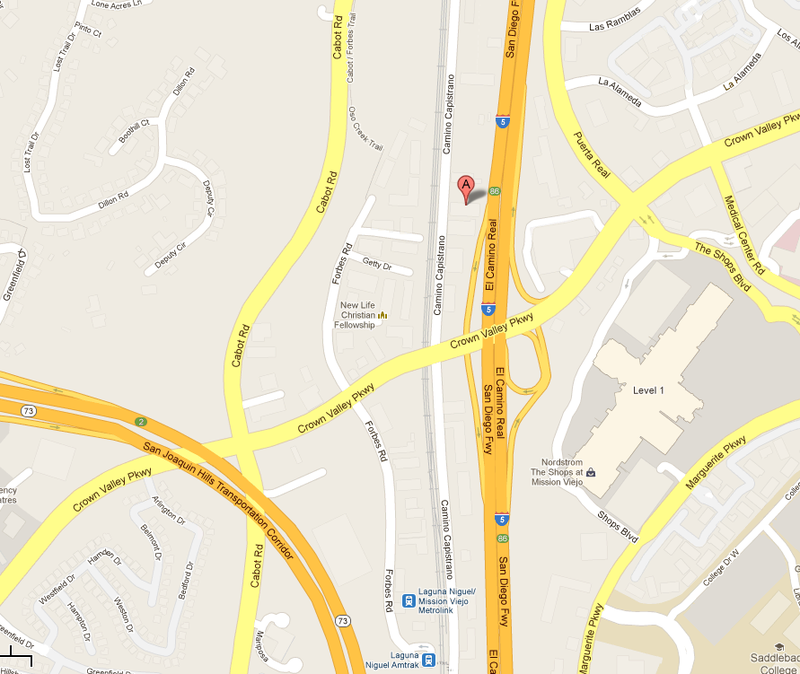 Laguna Niguel Collision Center is one of the few auto collision shops that does aluminum and steel damage repair. Our technicians are always learning about new technologies available, new techniques, and new materials being used in the automotive industry. In the last few years, we have seen an increase in manufacturers who are using aluminum to replace steel because it is much lighter while still retaining almost equal strength as steel. In addition some benefits of using aluminum over steel include boosting fuel-efficiency, lighter weight vehicle, and better crumbling zones. The downside is that aluminum is highly sensitive to other materials and coming in contact with another material like steel causes corrosion which means that a separate dedicated area is needed as well as separate dedicated instruments are needed to repair aluminum. 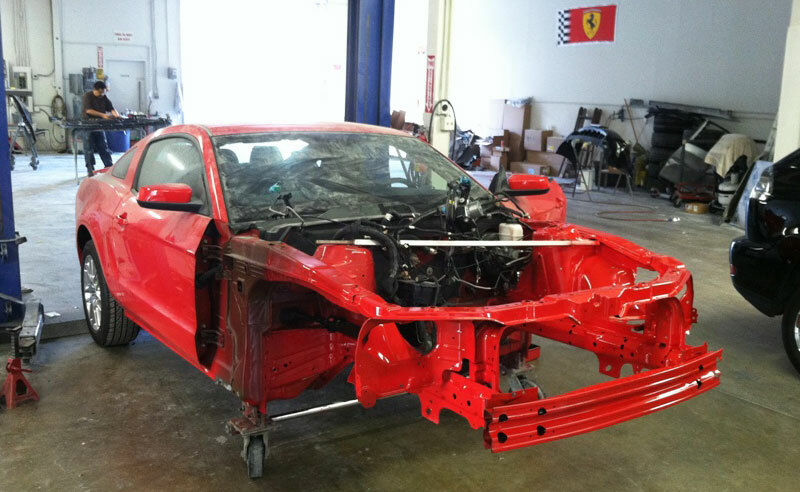 At Laguna Niguel Collision Center we have separate dedicated areas for working on aluminum, steel, and other materials as well as dedicated instruments for each. The repair process is much more complex for aluminum because of its unique characteristics which also means that if the technicians are not familiar with aluminum repairs, then there is a high risk of damaging the area further. Our technicians will assess the damage and the process to use and it will be repaired in no time at all. Welding is an art, it takes time and experience to learn how to weld correctly. Fortunately at Laguna Niguel Collision Center, our technicians have the knowledge and the experience to repair damage that requires welding. There are many variables to consider when welding like is it spot welding or line welding, the temperature to weld at, how long to keep the welder at a spot, the type of material, the thickness, and much more. The welding process is quite simple, first the technicians will inspect the panels. Next they'll fit the new panel to the old to make sure it is the correct size and make any adjustments if need be. Then they will remove the old panel and put the new panel in place holding it down with clamps. The technician will then proceed to weld the new panel filling in any gaps between the panels. The process is then finished off by inspecting the welds to be of quality workmanship and then grinding the new metal down to be flush. The final step would be to primer and paint the area to match the rest of the car, and protect the metal from rusting again. Our technicians will repair any problem that requires welding and can imitate the factory type welds making the repair seem as if it were never there.